In the eyes of many budding reporters, student unions are a treasure troves of stories. But accessing those stories has often proved difficult. 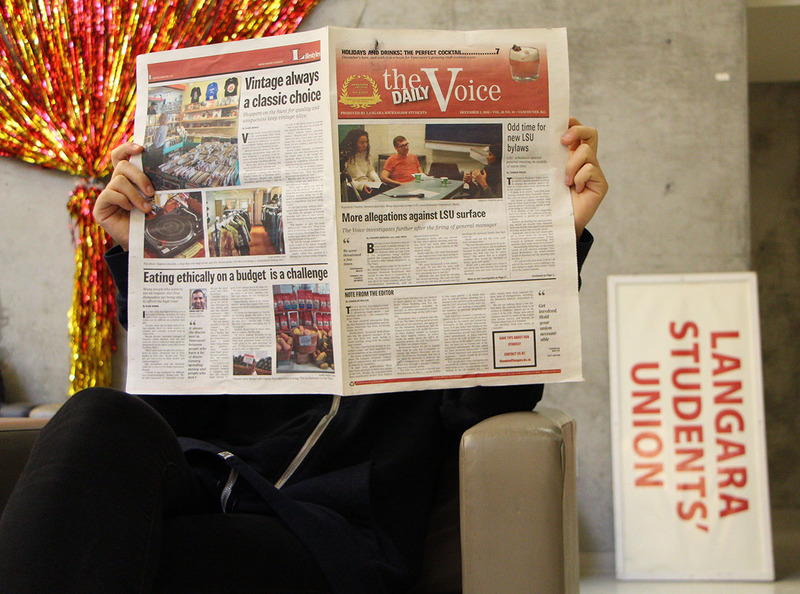 For years, reporters for The Voice have tried to write about their student union, the Langara Students’ Union (LSU), with little success. Whether writing about student union events or bylaw changes, the LSU has given little to no answer when Voice reporters question their inner dealings. And whether at Langara or elsewhere, unions run the risk of losing credibility as a voice for students when there is a lack of transparency about their activity. Former Langara journalism department chair Rob Dykstra knows all about the strained relationships between Langara journalists and the Langara Students’ Union. “As soon as The Voice was distributed, they went around and they emptied out all the boxes and threw the papers away,” Dykstra said in an interview with The Voice for a special LSU edition of the paper in Dec. 2016. The LSU is so averse to publicity that questions can no longer be asked in person, over the phone or by email. The LSU’s current policy states that all media questions must be sent through a form on their website and that reporters must allow up to 24 hours for a response. The LSU also has a policy in place that prevents reporters from taking photographs or video within their student union building. In 2015, Voice reporters requested to see the LSU’s budget and meeting minutes. While Voice reporters were investigating for journalistic purposes, they are also students and therefore part of the LSU’s membership— meaning they are entitled to copies of the budget. However, obtaining the budget and meeting minutes proved to be a more difficult task than it should have been. Vincent Matak, a former Langara journalism student, had reported on the LSU during his time in the journalism department. He says the LSU refused to release the budget while he was reporting for The Voice and that reporters were only allowed to view the meeting minutes after multiple requests. By law, student unions must disclose their meeting minutes, the budget and financial statements. A lack of transparency between student unions and their institution’s paper is not a problem solely plaguing Langara College; student reporters at other schools have run into similar roadblocks in their reporting. Mercedes Deutscher, news editor at Douglas College’s The Other Press, interviewed two Douglas Students’ Union council members last year in the hopes of better acquainting the students with their representatives. At the end of one of the interviews, the council member asked to speak to Deutscher off the record. Deutscher then tried to contact that council member again, but when Deutscher refused to send her questions in advance of the interview, the council member asked to be removed from all The Other Press articles. Deutscher says that their only punishment was being barred from future CFS conferences. According to Deutscher, the DSU council members also threatened to involve an international student in legal trouble and sexually harassed female council members. After a slew of threatening messages between the accused council members and Deutscher’s editors, The Other Press decided, on production night, to refrain from reporting on the allegations for fear of being sued. She adds that she felt as though she had disappointed the student body and missed out on an opportunity to create change in her community. Although the story wasn’t published, the council members weren’t re-elected and The Other Press now has a much better relationship with the DSU. In 2011, scandal also hit Kwantlen Polytechnic University’s campus. Its student union, the Kwantlen Student Association (KSA), was in shambles amid accusations that the KSA had misappropriated student funds. According to Doyle, the student association in 2011 tried to take legal action against Reduce All Fees (RAF), but dropped the case due to high legal fees. It was later discovered that the two student councils were colluding.